Safety wader made of PVC with reinforcements in critical areas, provides durable protection and comfort. The Forth is a safety thigh wader that is 100% waterproof with steel toecap and steel midsole specially developed to be used in fishery. Textile lining with rubber trouser grip areas. Steel toe cap protection tested to 200 joules impact. Steel midsole penetration resistant to 1,100 Newton. Front, ankle and heel deflector protection. PVC & Nitrile rubber sole is resistant to minerals, animal and plant oils and fats, disinfectants, fertilizer, solvents, manure, low concentration acids and alkalis. Handle temperatures up to -20 degrees, Ideal for use in fishery. 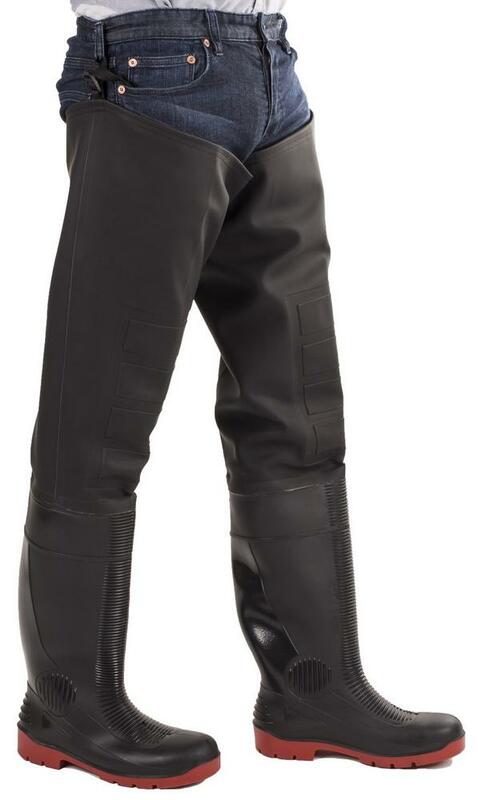 Amblers AS1001TW Rhone Men Thigh Safety Wader conforms to: EN ISO 20345 S5 SRA. PVC \ Nitrile rubber sole. Conforms to: EN ISO 20345. Requirements footwear Class II manufactured in one piece e.g. rubber and polymers. Standard 200 joule toe-cap protection, Antistatic and Energy absorption around heel, Penetration resistance and Cleated sole.